'Al Saqr' or 'the Falcon' Tower is an impressive structure build on one of the highest points of the new Loreesi colony of Port Valiant. From the top of the tower the sentries have a full view of the wide expanse of Sandy Bay, and can provide early warning of vessels approaching the port. 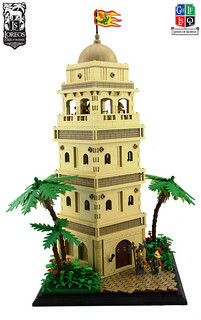 The tower's construction was supervised by Loreesi explorer and pioneer Captain Alphoso de Rojas who can be seen inspecting the view from the top.